About: Thomas Suárez’s experience as a researcher began in the 1980s with his work on the history of cartography. His books on that topic include Shedding the Veil , Early Mapping of the Pacific , and Early Mapping of Southeast Asia , this last work considered the standard text on the subject. His contributions to edited volumes include, "Early Portuguese Mapping of Siam", in 500 Years of Thai-Portuguese Relations , and "Genesis of the American West: The Cortes Map", in Mapping the West: America's Westward Movement 1524-1890 [Rizzoli, 2002]. In 2018, he authored a new Introduction to an expanded edition of Carlos Quirino's landmark Philippine Cartography. A professional violinist, Suárez is a former member of major US symphony orchestras and a former faculty member of Palestine’s National Conservatory of Music. A native of New York, Suárez now lives in London. BOOK HOMEPAGE, with illustrations of key documents (coming), reviews, and errata. Why has the Israel-Palestine ‘conflict’ endured for so long, with no resolution in sight? 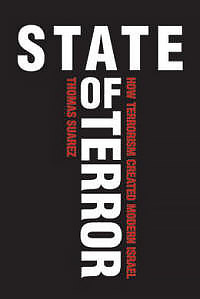 In this meticulously researched book, Thomas Suárez demonstrates that its cause is not the commonly depicted clash between two ethnic groups — Arabs and Jews — but the violent takeover of Palestine by Zionism, a European settler movement hailing from the era of ethnic nationalism. an Israeli state driven by unrequited territorial designs and the dream of ethnic ‘purity’. The role of Zionist terrorism in establishing the Israeli state and perpetuating today’s conflict is laid bare in Suárez’s groundbreaking narrating of the unbroken historical record. ••• "I thought I knew a fair bit about the Middle East after all the years I've been involved in its politics but this book came as an eye-opener. I realised how ignorant I was, not of the events since the establishment of Israel but of the terror campaign that led up to it. 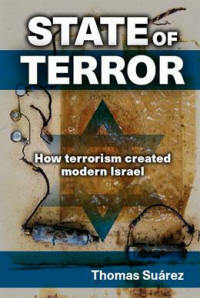 Everyone who has ever accepted Israel’s own account of its history should read this book... It should change them forever." 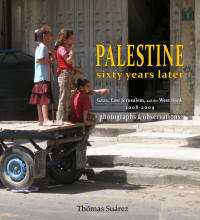 Palestine sixty years later combines 171 photographs and commentary into a vivid glimpse of modern-day Palestine. An Introduction summarizes the origins of partition, discusses methods of Zionist expropriation used in 1948 and in use today, and analyzes how Israel has exploited Judaism and the collective Western subconscious for its political ends. • "A beautiful, evocative book. Suarez's marvellous photographs capture more eloquently than any words the essence of what it means to live under Israeli occupation. The accompanying text is authoritative and to the point. An aesthetic and educational experience not to be missed." • "A moving, fact-filled and insightful portrait of a people under relentless siege." Published articles about Palestine and the "conflict"
• Map map on the wall, who’s most existing of them all? • UXOs: Did Israel deliberately arm Hamas? • Visit Abu Dis- site of the future Palestinian capital?